On August 23, 2016, Mailiaka was walking to work early in the morning at the intersection of Liberty Avenue and Waltham Street in Queens, New York. As she began crossing the street, a vehicle entered the intersection and struck her in the crosswalk while turning left. The car struck the left side of Mailiaka’s body and she fell to the ground. Thankfully, Mailiaka did not lose consciousness. The driver later claimed that he did not see the pedestrian in the crosswalk, which is why he accidently struck her. Mailiaka was taken by ambulance and evaluated at Jamaica Hospital Emergency Room, and was released with pain medication the same day. As a result of the accident, Mailiaka suffered injuries to her neck, back, left shoulder, left arm/wrist/hand and left pelvis/hip. She experienced throbbing headaches, poor sleep, and difficulty with daily activities. She was confined to her home for approximately 3 weeks, was totally disabled from employment for approximately 2 months, and is partially disabled from the accident to this day. Thanks to a referral, Mailiaka was told to contact Adam Handler – The Case Handler! She called our team for legal help and (like we do for all our clients) we handled her medical bills and dealt with the Defendant’s insurance company. Mailiaka was able to focus on getting better and our team took care of the rest! 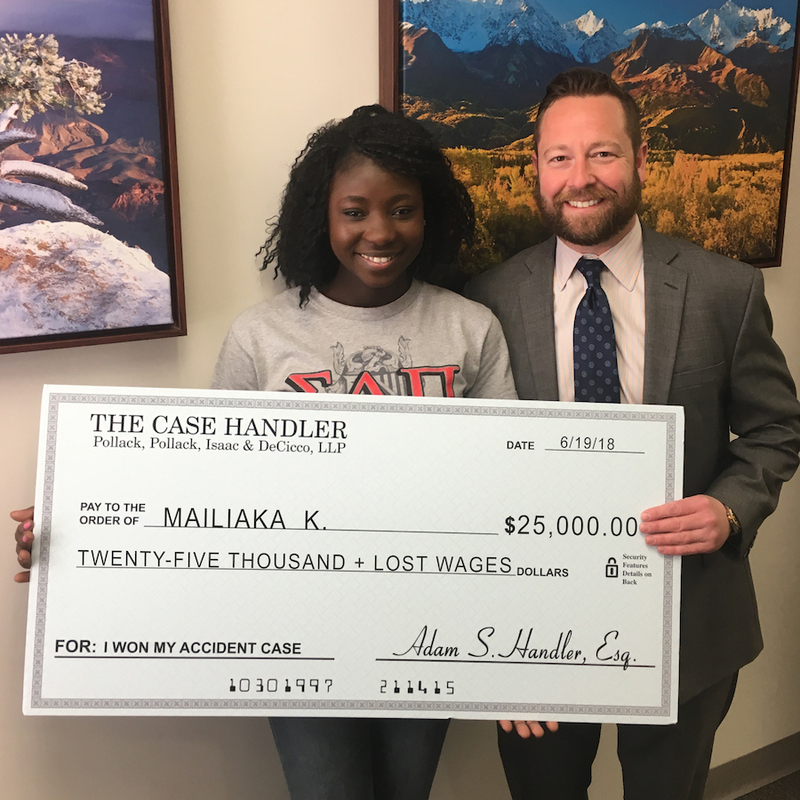 With the legal help of The Case Handler team at PPID, Mailiaka recovered $25,000.00 (maximum policy limit) AND all of her lost wages!